Group Genius reveals that creativity is always collaborative — even when you're alone. This book is filled with compelling stories about the inventions that change our world: the ATM, the mountain bike, and open source operating systems, among others. In each case, Sawyer shows the true story of innovation: in spite of the "lone genius" myths that always spring up after an invention's success, these important inventions always originate in collaboration. 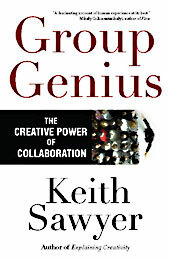 Group Genius shows us how to be more creative in collaborative group settings, how to change our organizations for the better, and how to tap into our own reserves of creativity. The empowering message is that all of us have the potential to be more creative; we just need to learn the secrets of group genius.